Design By Humans: Memorial Day Sale - Blog @ That Awesome Shirt! 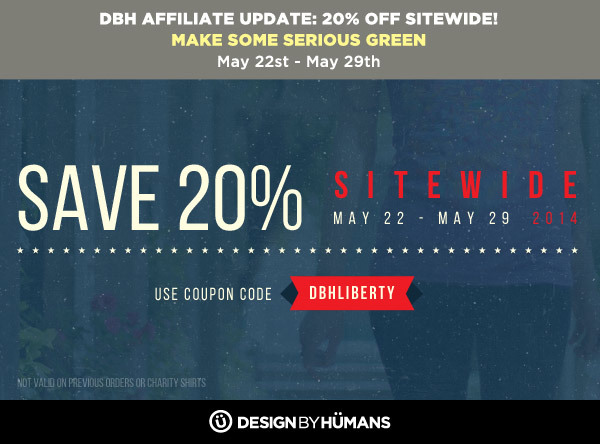 This year, celebrate Memorial Day with Design By Humans and get 20% OFF sitewide! From Thursday, May 22nd to Thursday, May 29th, use sale code and get 20% OFF your entire purchase - NEW tanks, crewneck sweatshirts and Galaxy S5 cases included. Did we mention we offer the largest print area in the industry? Shop DBH tees, tanks and crewnecks and get more of what you’re paying for - cool graphic art! Also, don’t forget to take advantage of FREE Domestic Shipping on any orders over $75 and $10 shipping for International orders over $125. Ends 29th of May, 2014.